Transporting grain to market on time is important, and to the increasing number of producers, elevators and co-ops who store and market their own grain, being able to load semi’s quickly and easily is highly valuable. FCS Manufacturing has put together a package for Overhead Loadout Bins that considers each detail from safety, to ease of use and delivery of the completed product. A key benefit to an FCS mfg. Overhead Loadout Bin is the flexibility and specific customization that is available. Our in-house engineering allows us the flexibility to design each bin to fit your specific project. Every quality bin starts with a solid base. We use heavy duty I-beams for legs, and thick walled square tubing to brace the legs. 10 gauge minimum steel is used for top and side panel construction, with 3/16″ steel used for the hopper. All hopper ribbing is on the outside, leaving a free surface for material to run against. In the corner of the hopper, a kite shaped piece is welded in to keep material from building up. Our bottom doors come equipped with steel rollers and use a rack and pinion crank to easily open the door, or we can bolt on any after-market door to our angle flange. Loading semi’s can be a full-time job, so our ladder landings are a popular feature customers take advantage of. We take safety seriously, keeping our Overhead Loadout Bins up with OSHA safety regulations. 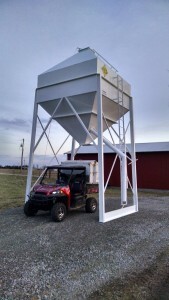 We are able to deliver the completed product to your project site, and stand up bins 2250 bushels and smaller. Focus on what you do best, and allow us to help you with what we do best. 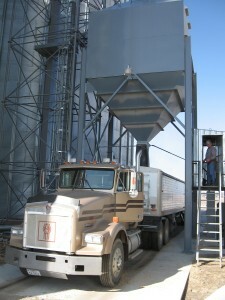 With the ease of ordering bulk feed from your local elevator or feed mill, why purchase sack feed anymore? More and more cattle producers are taking advantage of the lower costs, less labor and increased efficiency in purchasing bulk feed to supply their cattle operation. FCS Manufacturing’s Overhead Feed/Cube Bin package is designed to help Mid-West ranchers handle their feed easily and efficiently. Bins are designed for years of maintenance free use. These Overhead Bins are built to last, with feed bins still in operation after 20+ years of use. The Ground-Operated Top Door is controlled with one rope, and is then tied down with the same rope ensuring that the wind will not blow open the door, chancing it to rain or snow. The bottom door can also be controlled from the ground, or from the back of a flatbed truck. Each bin is primed on the inside, with the outside receiving a primer and top coat of a Professional Grade Enamel paint. Overhead Feed/Cube bins are also built using 10 gauge steel for the top, side and hopper panels creating a strongly built bin. All side-wall and hopper stiffeners are welded on from the outside, creating a smooth surface for material to slide against. Standard hopper slope is set at 51 degrees to ensure proper clean out. A kite shaped piece is welded in to keep material from building up. I-Beam legs and square tube bracing allow this bin to stand up to heavy winds, and not buckle or twist. Fill it with cubes, ground feed or sand; this bin can handle it all!